This is the only BW8 stack to have its roots in the 1960's. When Intercontinental Airport opened in 1969, the BW8 feeders between I-45 north and US 59 north were constructed. Two direct connectors were constructed. 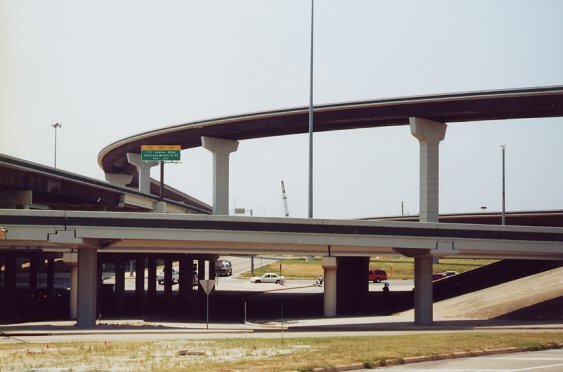 The Beltway 8 main lanes were added in 1991, and three new connectors were completed in 1998. One of the connectors replaced a 1960's connector, so four connectors are in service at the present time. In the aerial photo taken around 1996, the connector ramps are under construction and I-45 is being widened. The remaining four connectors have just begun construction as of August 2000. Photo taken circa 1996, when construction was in progress. Looking west. As of August 2000, this interchange included only one high-flying ramp.